Famous 'pirogi' stuffed pies now available at Stolle eatery in Camden. If you're looking for Russian cuisine in London, you may find a decent selection of Russian-themed restaurants, caviar and vodka taverns and classy bars from the country's most famous restaurateurs. Most of the places offer an exceptional experience - along with a hefty price tag. Now, Russian restaurant chain Stolle specializing in pirogi - traditional closed pies - has opened an outlet in the capital for hungry customers with a healthy appetite but more modest budget. Stolle offers pirogi - its signature dish - to suit all tastes. Handmade pies come stuffed with meat, chicken (known as kurnik), cabbage, fish, mushrooms, spring onion and assorted sweet fillings, including strawberry, lemon, apricots and apples. Situated on Camden's famous thoroughfare, Parkway - which is home to a rainbow of restaurants and cafes - Stolle is London's top option when it comes to Russian "fast" food. But that does not mean a quick meal should lack an authentic taste. Despite its devotion to homely Russian cuisine, you wouldn't know this was a Russian restaurant from its design. The food speaks for itself. Stolle - a much loved chain in its homeland - came to London to unite all sort of people through the love of good and affordable homemade Russian food such as borscht, Chicken Kiev, pelmeni - Russian dumplings - and, of course, the signature dish, pirogi. Launched in St. Petersburg in 2002 by Alexander Bordyug and Vasily Morozov, Stolle become popular among locals and visiting tourists looking for an affordable way to taste pirogi. Simple but incredibly tasty, sweet and savory pies carry with them traditional values of good, homemade food and family unity. Even the restaurant's name is rooted in the family. The sonorous name - Stolle (also a type of traditional Saxon pie, Stollen) comes from the surname of Alexander's grandmother. Today Stolle is a fast growing chain with the branches all over Russia and neighboring countries such as Ukraine and Belarus. Now the team behind the project is aiming beyond its Slavic homeland, hoping to find a niche in the extremely competitive British market. In autumn Stolle is planning to open several more restaurants in London and branches in New York. In the London restaurant world, where customers are spoiled for choice and there are outlets for just about every cuisine in the world, it's almost impossible to find a niche market. Tatiana Isaeva, creative director for Stolle, believes that "good old recipes, excellent food quality and street prices in a sit down restaurant" are among the secrets of its success. "In Stolle, we are extremely attentive to the quality of the food. Back in Russia, Stolle is famed for its tasty pies and traditional recipes." A key challenge in launching the London branch was to maintain those quality levels, she adds. It is a tricky process - particularly given that some of the pie fillings are hard to source in Britain. "Did you know that it's surprisingly hard to find a sour cherry in Britain?" 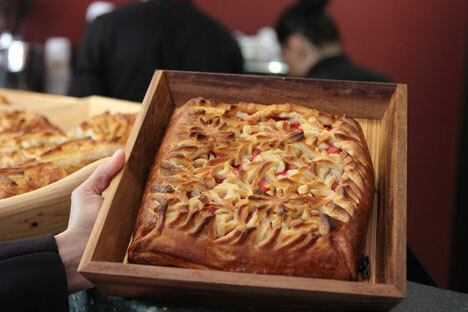 Russian chefs had been brought in to train local bakers and share the "small secrets" involved in making the perfect pie. "Every single pie is baked fresh each day," Tatiana says. Fillings for pies reflect what is available seasonally and are always fresh, she added. Every single pie is not just baked fresh each day; they are baked four times a day so you will not be sold a morning pie in the evening. The London branch, she adds, recreates the same look and atmosphere of Stolle restaurants in Russia. “Obviously, taking into account London's speed of life, we add such essential for this city service as fast delivery and take away. In fact, delivery is one of the biggest priorities for our business since the pie is incredibly convenient type of dish to bring to an event, meeting or business lunch for feeding large crowd," Tatiana adds. Customers unfamiliar with Russian cuisine are sometimes surprised by how many different taste sensations can be offered in one modest pie wrapping. "Once we offered a customer, who did not know Russian food, a cabbage pie. He was sceptical and surprised by such a combination and at first refused even to take a small bite. Eventually, he plucked up his courage. Much to our surprise, cabbage pie became his favorite."